The Kosmaj Inn is located in the city centre. It has a long tradition, which is confirmed by numerous guests, who return to this restaurant for years in a friendly mood to the mutual satisfaction. Most of the meals served at the Kosmaj Inn received gold and silver medals from various cooking competitions. 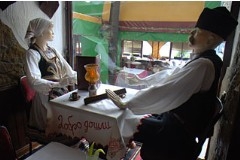 Kosmaj is a restaurant of national cuisine, and on the rich menu are especially distinguished dishes of old southern Serbia, grilled dishes, and ready-made dishes.